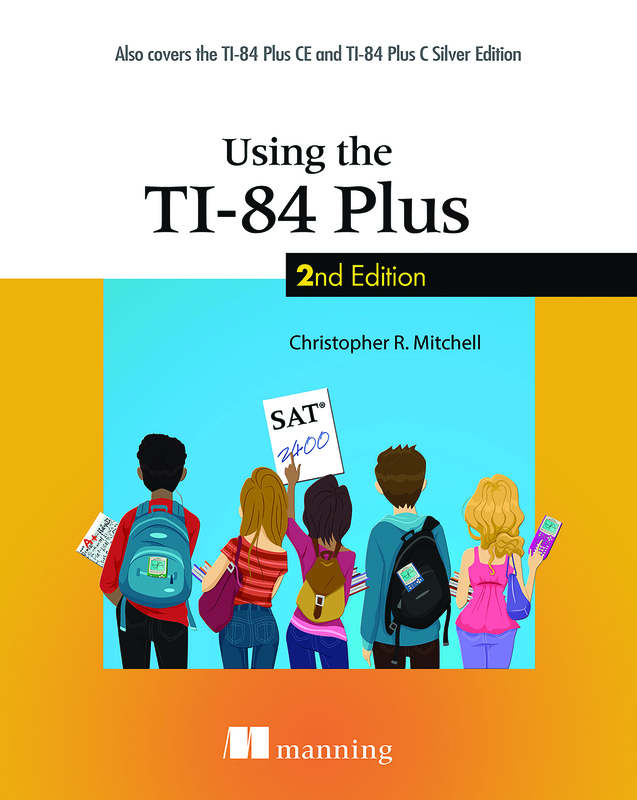 Thank you for purchasing Using the TI-84 Plus, Second Edition. Please post any errors, other than those listed below, in the book's Author Online Forum. We'll compile a comprehensive list and publish it here for everyone's convenience. Thank you! "When your entry looks like the center screenshot in figure 1.6, [...]"
This should instead refer to "the right screenshot in figure 1.6"
"[...]and your screen matches the right side in figure 1.6, [...]"
This should instead refer to "the left side in figure 1.6"
"Each cycle is π wide"
Trigonometric functions have a period of 2π; these annotations should say "Each cycle is 2π wide." The fourth L1 value on the left side of figure 1.13 should be 118 rather than 1184. Page 16, section 1.1.5, second bullet under "Finding a Line of Best Fit:"
"To graph y= 21.5x 141.7 quickly, press [Y=] and then [>][>] to paste the RegEQ into Y1." There should be a "[VARS]" before ""
"The TI-84 Plus CE appears on the front page of this book, [...]"
The cover design no longer shows a TI-84 Plus CE. Only older monochrome TI-84 Plus Silver Edition calculators appear on the cover. Page 28, in "Essential basic calculator key sequences:"
"Makes the screen darker (hold the arrow key);" "Makes the screen lighter (hold the arrow key)"
These instructions are reversed. On the color calculators, [2nd][Up] makes the screen brighter, and [2nd][Down] makes the screen dimmer. The monochrome calculator instructions in this box remain correct. "If you really want to wipe it clean, press the left arrow twice in the RAM/Archive/ALL menu to choose ALL, and proceed from there." Press the right arrow twice to get to the ALL option. The TI-84 Plus CE has no FRAC answer mode; the only options are AUTO and DEC. While this box is correct for all earlier calculators, including the TI-84 Plus C Silver Edition, it omits the detail that these instructions do not apply to the TI-84 Plus CE. "Figure 2.6 also demonstrates a special key, [x^2]." This sentence should instead refer to figure 2.7. "Like 1 1/2;" "Like 3/2"
These annotations are reversed. Un/d is like 1 1/2; n/d is like 3/2. "[...] but int(-3.9)=4 and int(-3.1)=4. Two negative signs are omitted. The correct text should specify that "int(-3.9)=-4 and int(-3.1)=-4." Page 69, "Finding the intersection of two functions:"
"3. Your calculator asks you to find the approximate intersection point; then press [Down]." The key is incorrect. It should be [Enter], not [Down]. "The colon is [2nd][. ], as you can confirm by looking at the blue or orange text above [.]." The correct text is "The colon is [ALPHA][. ], as you can confirm by looking at the green text above [.]." "The Math tab of the Matrix menu contains 15 different functions and tools [...]"
There are 16 functions in the Math tab of the Matrix menu. The same error is present in the caption of figure 4.33 on page 110. "[...] and *row( performs the two operations together." This last command should be "*row+("
Although the right side of the figure shows a Lissajous figure, and it corresponds to the equations shown on the left side of the figure, this representation does not match the information provided in section 5.1.3. For clarity, the equations should be presented as Y1=8sin(5(T+90)) and Y2=8sin(3T). "Remember that by default Θ goes from 0 to π[...]"
As correctly cited at the beginning of section 5.2 on page 123, by default Θ goes from 0 to 2π. "You can reverse the direction of the spiral by setting r1=-Θ/π instead." This does not reverse the direction. The correct sentence is "You can rotate the spiral around the original by setting r1=-Θ/π instead." "Notice the annotated points on the graph,[...]"
These annotations were omitted from the graph. The reader may press [TRACE] and use the [<] and [>] arrow keys to explore the coordinates of points on the graph. "[...] [XTΘn] is the n variable in Parametric mode, [...]"
This refers to Sequence mode, not Parametric mode. The first argument to the Circle( command is <center_x>. The pair of closing parentheses at the end of each of the two Line( commands in the screenshot should be omitted in order to make the point referenced in the "Missing closing parentheses" box. "If you have a TI-84 Plus C Silver Edition, you'll see L1 through L5, because the screen is wider; you can scroll right to find L1." This should say "If you have a TI-84 Plus C Silver Edition or TI-84 Plus CE, you'll see L1 through L5, because the screen is wider; you can scroll right to find L6"
"[...] and [2nd][ALPHA][MATH][TAN][SIN][^] (for the AGES)." These instructions would type "AGEH". To type "AGES", the correct sequence is [2nd][ALPHA][MATH][TAN][SIN][LN]. "The number you place after nCr, r, is the number of items to be chosen." This section is about permutation, for which you use the nPr command. This sentence should refer to nPr rather than nCr. "[...] so if you were to collect 900 samples from rand and create a histogram (as from chapter 7), [...]"
Histograms were introduced in chapter 8, to which this sentence should refer. "If you have a color-screen TI-84 Plus CE or TI-84 Plus CE, you'll want to read chapter 12 to learn about their unique features and tools." The repeated "TI-84 Plus CE" should be "TI-84 Plus C Silver Edition", the other color-screen calculator in the TI-83 Plus/TI-84 Plus family. "[...] and a = 2, b = 1, c = 2 (right), which yields distinct but imaginary roots." The coefficients shown in the figure are correct; the coefficients in the caption are not. The correct coefficients are a = 1, b = 4, c = 5 for the right half of the figure. "You'll be prompted for A, B, and C, as shown on the left in figure 11.6." The figure reference is incorrect. The left side of figure 11.7 shows the discussed program prompting the reader for A, B, and C.
"If you run this program, you'll find that there are 43 such numbers." Running the code shown reveals that there are 41 such numbers, not 43. "This drops you back onto the homescreen." This should read: "This drops you back onto the graphscreen." The first argument to the Circle( command is <center_x>. The same error appeared on page 137. The Pxl-Off command only takes two arguments. This table row should use two examples: Pxl-On(30,52,BROWN) and Pxl-Off(30,52). "[...] S(n) = 6 + 8(n  1) for n?1 [...]"
A typesetting error occurred. The question mark should be the ≥ (greater than or equal to) symbol. A typesetting error occurred. The 4 after 10 should be superscripted, yielding E4=104=10000. The last paragraph of this section mentions the FRAC answer mode, which all calculators up to the TI-84 Plus CE have, but which the TI-84 Plus CE omits. While this section is correct for all earlier calculators, including the TI-84 Plus C Silver Edition, it omits the detail that these instructions do not apply to the TI-84 Plus CE. Two negative signs are omitted. The correct text should specify that "int(-3.9)=-4 and int(-3.1)=-4." The same error appears on page 47. "As in normal (Function/Rectangular) mode, in Polar mode the Zoom menu options discussed in section 3.3.1 can be used to adjust what you see in the graph." This should discuss the Zoom menu options in Parametric mode, not Polar mode. "To adjust the range and granularity of Θ values plugged into the parametric functions, use the Window menu." This should discuss the Window menu options for polar functions, not parametric function. The first argument to the Circle( command is <center_x>. The same error appeared on pages 137 and 282. Although not an error, the additional note that the Catalog can be accessed via [2nd] should be added to this caption. "[...] and press [ENTER] again to store the value into the matrix element." Although this is correct, it doesn't mention that you can also finish editing a matrix element by pressing an arrow key, allowing you to simultaneously move to a new matrix element you want to edit (and saving time and keystrokes). Although this is correct syntax, the reason why it is correct is not explained until section 6.2.2. Both figures specify that the graphscreen has pixel coordinates from column 0 to 94 and row 0 to 62. This is correct for the monochrome calculators; for the color TI-84 Plus C Silver Edition and TI-84 Plus CE, the pixel coordinates go from column 0 to 264 and row 0 to 164. The German mathematician is Leibniz, not Liebniz. The first row of the table mentions Then/End or Else/Then/End. To mirror the order in which these commands are used in code, this sentence should mention Then/End and Then/Else/End. "[...] you don't you need to find the length of the hypotenuse." An extra "you" appears in this phrase, which should read "you don't need to find the length of the hypotenuse." Particular thanks to reader Arnd Duschek for reporting the majority of these errata.